Theatre” featuring “L’enlevement de la Toledad” an operetta, in 3 acts by Edmond Audran with Mr. Hu Guenet and Ms. Rosine Maurel. This operetta (playing nightly) started October 17, 1894, represented the Romantic style & period. This operetta was so successful that it ran thru to the next century. 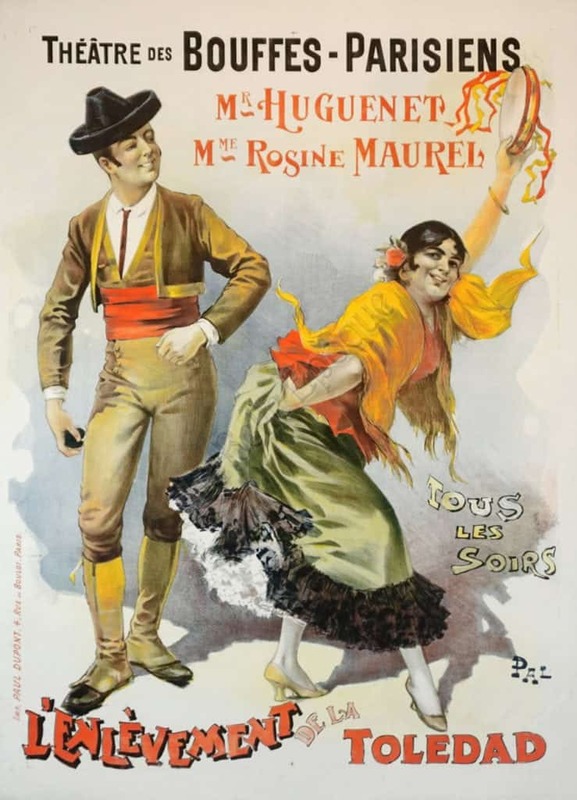 In this specific advertising poster, we see Spanish dancers (the aforementioned actors/actress). The Ms. is shaking a red tambourine, and wearing colorful Spanish style clothing with an orange/yellow top, a green skirt with lacey ruffles, and yellow heels. The Mr. is wearing a pointy black hat, a tan suit, tap shoes and castanets in his hands.